One of my favorite things happened last weekend. I was casually introduced to a new vegetable. While picking out my familiar items such as beets and carrots, I happened to overhear the woman who was making her purchase. 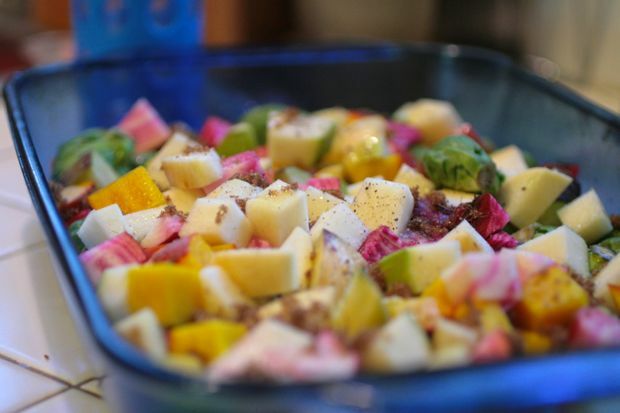 She was discussing what she was going to do with her produce and mentioned how rare it is to find the two vegetables she was looking for: rutabagas and turnips. 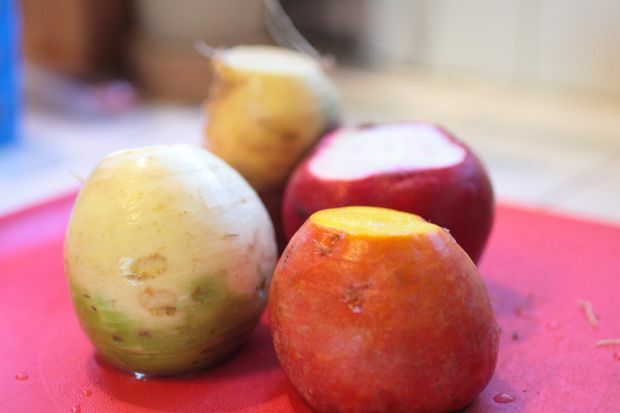 We grew turnips in our garden last year…I was really grossed out when eating them raw. As I found out with my initial aversion to kale, it sometimes only takes the right recipe to bring out the greatness in a vegetable. 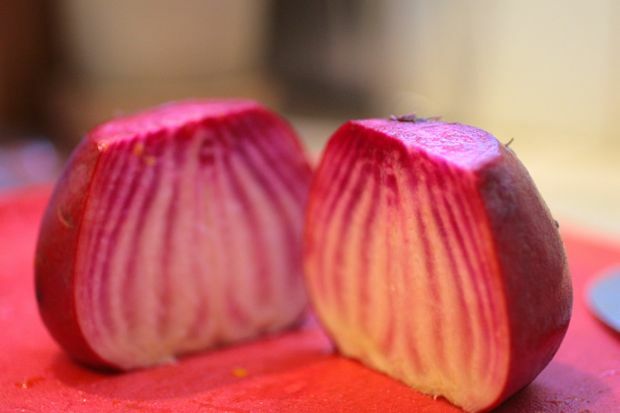 After a little more inquiry, I learned you can roast both these vegetables as easily as you might roast beets or carrots. I asked for a few small picks and happily hurried home to give both these vegetables a fighting chance. I had recently learned an incredible secret to roasting vegetables: sugar and high temperatures. I swear to you, even your children will eat this, as long as they can get past the fact that it is a vegetable. If for some horrific reason, they refuse to eat it, you won’t even argue. You wan’t them to hate it because it just means more leftovers for you. You will want leftovers. Trust me. Preheat oven to 400 degrees. 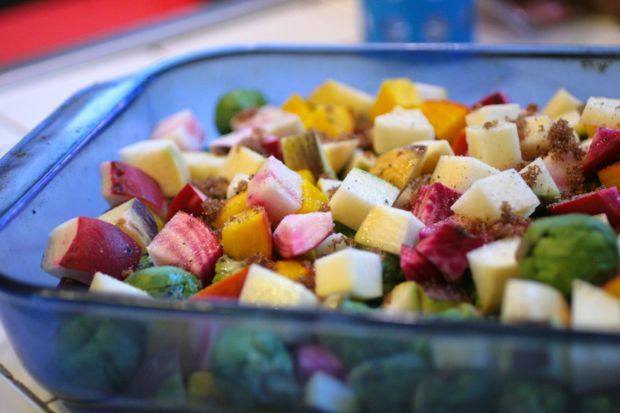 Cut vegetables in chunks. Don’t be precise about this, just cut it about the size you would want to put into your mouth. A little rectangle or square. Place in lipped oven proof pan, coat with sugar, salt, pepper and oil and roast for 30-45 minutes. Roast until they are tender and browning. The high temps bring out the natural sugars in the vegetables and the brown sugar gently caramelizes the top. This can be refrigerated and happily eaten as leftovers for days afterward.